On the outside, the Viziv looks like Subaru’s version of the Range Rover Evoque. It’s a two-door, four-seat vehicle with a high driving position, low roofline, and a big spoiler above the tailgate. It’s definitely something we’d like to see on the road, except for the headlights. The trim pieces that frame the grille make it look like the concept’s makeup is running. The giant side windows that serve both front and rear passengers would probably be impractical in real life. As much as we hate to admit it, so are the Lamborghini-style scissor doors. The Viziv’s hybrid powertrain is closer to reality but, since this is Subaru we’re talking about, it’s a bit odd. Called Subaru Boxer Diesel Hybrid, it uses: a 2.0-liter turbodiesel boxer four, continuously variable transmission, a lithium-ion battery pack, and three electric motors. One electric motor is coupled directly to the transmission and helps drive the front wheels, while the other two drive the rear wheels without any direct connection to the diesel. Like most hybrids, the electric motors help power the Viziv at low speeds; the diesel takes over for highway cruising. The rear motors can also be used for torque vectoring, which sends power to the outside wheel during cornering, improving handling. Subaru’s choice of a diesel engine would make a production car an outlier. Most manufacturers have shied away from diesel hybrids because of the added cost of a diesel engine, and difficulties in synchronizing power delivery. Diesels aren’t very effective at high revs, when internal combustion is supposed to take over in a hybrid. The interior has a two-tone color scheme and blue nightclub lighting, but it’s still fairly for a concept car. The binnacle gauges are a nice alternative to the amorphous digital gauge screens that are popping up in a lot of production cars. Since the Viziv lacks a rear prop shaft, it also has a flat floor. 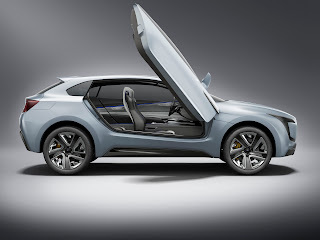 Subaru says that, despite the rakish bodywork, four adults can sit comfortably inside. For now, the Viziv is just a concept, but the world will get a lot more interesting if Subaru decides to put it into production.